In this section, the water-model is completely abandoned in favour of actual electrical circuits. Transistor-implementations of 2 types of Boolean blocks are presented, and some new terminology and symbols are introduced. 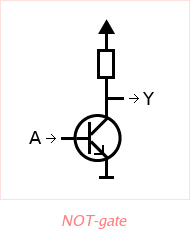 The last examples from the previous section basically inverted the voltage at the base of the transistor: if the base-voltage was low, the voltage at the location indicated by the arrow was high, and vice versa. Thus, this is an implementation of a NOT-block, or inverter. Up to now, the term "block" was used for a circuit implementing a Boolean function (such as "NOT"), but the proper term used elsewhere is "gate". This new term will be used from now on. The previous figure can be redrawn as shown here, omitting non-essential parts. It's easy to see that the NOT-gate has 1 input (at the left), and 1 output (at the right). It's common to use labels "A", "B" etc. for gate-inputs, and "Y" for the output. The upward-pointing arrow-head at the top of the circuit indicates "high voltage", corresponding to the battery's positive terminal. This symbol is convenient, because it avoids having to draw a lot of lines between components and battery. Instead of "high voltage", the term "Vcc" (with or without subscript "cc") is commonly used. The short flat horizontal line at the bottom of the circuit indicates "low voltage". As with the "high voltage" symbol, this symbol avoids having to draw a lot of lines. Instead of "low voltage", the term "ground" is commonly used. Without going through the same level of detail again, a NOR-gate can be formed by placing 2 transistors in parallel, just as 2 valves were placed in parallel in the water-model. 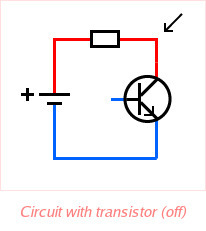 This circuit is shown here with 1 secondary battery, connected to the leftmost transistor. Thus, the voltage at its collector and emitter are the same - at ground-level - as is the voltage at the location indicated by the arrow. This gate can be drawn in isolation, thus leaving out the primary battery and wiring. As can be seen, the NOR-gate has 2 inputs (bottom left and right), and 1 output (top right). Up to now, the only non-trivial gate shown was the NOR-gate. 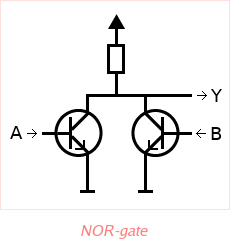 Another commonly used gate is the NAND-gate. Recall that the result of the NAND-function is True, unless both of its inputs are True. Or put differently: the output is only False in case both of its inputs are True. By now, from earlier examples, the function of the transistor (or valve) should be clear: the transistor (or valve) conducts only if voltage (pressure) is applied at its base. 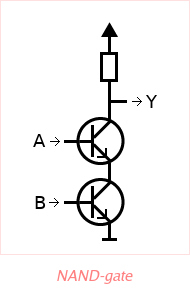 Consider 2 transistors placed behind each other, as shown in this figure. Current can flow from the top of the top-most transistor to the bottom of the bottom-most transistor only if they both conduct - that is, if a high voltage is applied to both their bases. 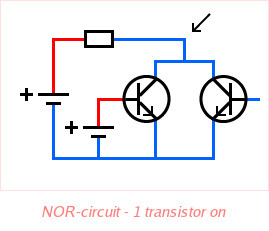 When a resistor is placed in front of these 2 transistors, a circuit similar to the NOT-gate is formed, except with 2 transistors instead of 1. The voltage at the output-terminal of this new gate is only low if both base-voltages are high.